If this wasn't enough the blade etch is is done using the "Reverse Frosted" technique and finally, a special "horse shoe" shield was inlayed into the green smooth bone. The blade etch is similar to the box art, which I beleive was done by Brian Wilhoite, lead designer at Smoky Mountain Knife Works. Currently this is the last five inch toothpick made by Rough Rider. As anyone who follows RR on Facebook knows, I make pleas almost monthly for more five inch toothpicks. 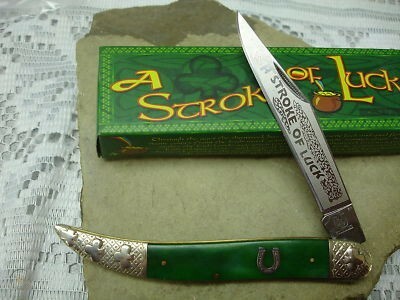 Packaging: Knife comes in the A Stroke of Luck tray style cardboard box.